Pack Your Passport, Baby: Scenery and giants and geysers, oh my! Reykjavik with a toddler. Scenery and giants and geysers, oh my! Reykjavik with a toddler. Reykjavik is a great place for kids. With so many natural attractions, activities and museums, I can’t imagine ever running out of things to do! This past summer, we visited Reykjavik on a stopover on our way home from Norway. On this particular trip, we opted to leave our car seat at home, and instead rented a car seat through our car rental provider. Though the car seat was physically safe, it wasn’t particularly clean, and rigid latch design (rather than the latch straps I am accustomed to) made installation a bit of a chore with cold fingers. One of those times I wished we had brought our own car seat. Reykjavik has a good transportation and tour network, so a car isn’t necessarily required. On a previous trip, we used the FlyBus to/from the airport, and joined in on a couple of excellent tours. On this trip with our toddler, we appreciated the flexibility of having our own wheels, and found the roads in and around Reykjavik easy to navigate. Reykjavik has a large variety of international food options, so there is always something available for even the pickiest of eaters. Be sure to try Skyr, an Icelandic version of yogurt. Though it is thick and creamy, it is high in protein, low in fat and really delicious. We had dinner one night at Happ in Reykjavik’s city centre, which serves a variety of dishes, like green curry, lamb and pasta. The food was phenomenal – fresh and delicious, and their healthy kid’s options (wholegrain pasta, or pizza with fresh tomato salsa) made both B and me happy. We rented a 2-bedroom flat near Hallgrimskirke which worked out perfectly, and gave us plenty of space. It was in a great location – within walking distance to all the sights in Reykjavik, and easily accessible from the airport. A full kitchen allowed us to prepare many of our own meals. Be aware that Reykjavik is on a slope so a walk into town from the Hallgrimskirke area requires an uphill walk on the return journey. It’s no surprise toddlers aren’t always interested in long, scenic drives, and Iceland’s gorgeous natural attractions are not necessarily suitable for little ones (lots of walking on uneven surfaces, steam vents etc.). We timed our scenic drives and geyser visits during B’s naps. While he slept away in his car seat, we enjoyed the scenery, and took turns exploring away from the car. With 18 geothermal pools and even a geothermal beach, there are no shortage of places to go swimming year round in Reykjavik. On this trip, we took our son to The Blue Lagoon. Read about our visit to The Blue Lagoon. Reykjavik has plenty of open spaces to run around, playgrounds and recreational pathways for walking and cycling. The Laugardalur Valley area is home to the Reykjavik Family Park and Zoo, playgrounds and lots of green space. Tjornin Lake in the city centre is a great place to relax and feed the ducks in summer or ice skate in winter. Playgrounds can also be found at Miklatun Park near the Reykjavík Art Museum and on Arnarholl Hill which also boasts a lovely harbour view. Viking themed playgrounds can be found a little further afield at the Vidistadatun Sculpture Park in Hafnarfjordur and in Mosfellsbaer. Though Grindavik is best known as the location of The Blue Lagoon, the town proper is a convenient detour if you find yourself killing time before heading to the airport. In just a short drive around town, we found no fewer than three large, well-maintained playgrounds making it a handy place for kids to burn off some energy before a long flight. The Black Cave of the Giantess in the Keflavik Harbour also makes a fun diversion on the way to the airport. The idea of Icelandic author Herdís Egilsdóttir, the cave is home to the giantess, a character in her popular series of children’s stories. 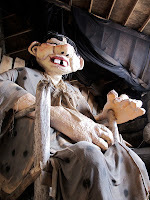 According to Egilsdóttir, the giantess is 400 years' old and over 5 meters' high with eyes the size of footballs. The giantess sits in a rocking chair and you can hear her breathe and make other (more entertaining) noises. We found the cave by accident on our drive to the airport. Unfortunately B never got to see it – he was sleeping soundly in the car – but the cave was good fun and still makes me smile when I think about it. Entrance is free, but it is only open weekends from 1-5 pm. Reykjavik’s Keflavik International Airport (aka Leifur Eiríksson Air Terminal) feels much too small for the number of passengers traveling through it, and there are no traditional gate areas. I think the theory is, passengers are expected to wait as long as possible in the main terminal, then go through security at the last minute prior to boarding – as such, there is very little seating available while awaiting flights. In reality, with increasing airport security, this isn’t practical, so most of us will end up waiting for our flights post-security. Post-security blues: There are very few washrooms in the terminal and as you can expect, there are particularly long lines for the women’s washrooms. It is definitely advised using the washrooms BEFORE heading through security. There are a couple of small food outlets (we have always experienced long line ups here too) selling snacks and coffee, so it is best not to rely on the airport shop for picking up snacks. You cannot buy milk in individual serving cartons, however larger cartons are available for those wanting milk in their coffee, so we’ve filled our son’s sippy cup with those. Strollers: If you have gate-checked your stroller for your incoming flight, be aware you will NOT be able to use it when you arrive at the airport. For transiting passengers on their way to another destination, your stroller will be taken directly to your connecting flight. If you are staying in Reykjavik, strollers can be collected at the baggage claim area. The airport provides strollers for use within the terminal.